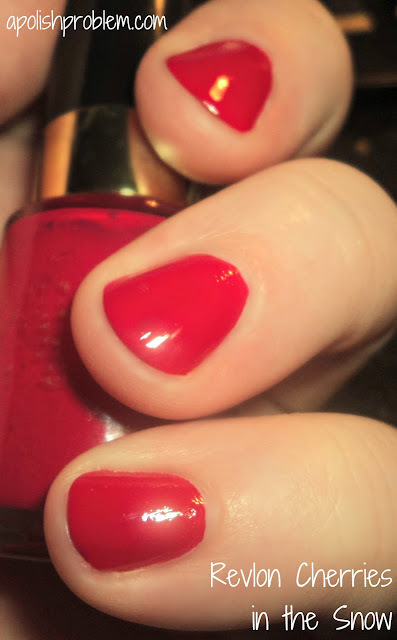 This is 2 coats of Revlon Cherries in the Snow with one coat of Sally Hansen Insta-Dri topcoat. Cherries in the Snow is a bright reddish pink creme. I've seen it also described as a cherry red, but in my opinion, it's most definitely a pink... a very red-based pink, but a pink, nonetheless. At any rate, it's a fantastic color. If you ask me, it's one of the hidden gems in the drugstore cosmetics department. Cherries in the Snow has been around almost as long as Revlon itself, and I know that some of you have probably had this, and/or the matching lipstick, in your makeup collection for years. Myself, I purchased my first bottle of this in early 2002. I remember the time so clearly because that's when Tim was working out of town in Ohio. One Friday, when he was on his way home, I went by Walgreen's to kill some time before he got back in town and happened to see this color in Revlon's nail polish display. I had owned the lipstick color years before and was instantly intrigued by the color in polish form. So, I got it, but once I tried to use it, I was reminded why I was never a fan of Revlon's formula. I remember it being hard to use, so I don't think I ever used it again, and probably discarded it when we moved from our old apartment. However, that said, I always remember being in love with the color, and I think over the years, I've probably purchased this particular polish probably 2 additional times. This last bottle (the one pictured) has been in my collection since before I started blogging. I remember buying it in Florida when the twins and I went on vacation with my inlaws. That time as well, I remember being unhappy with the formula right after I got it. That is the main reason I didn't and still don't purchase many Revlons. Well, 3+ years later, and quite a bit of nail polishing experience under my belt and I've learned how to make it work for me. Thin coats and a thinner quick-dry topcoat, seem to make it play nice. It's still not a perfect application, and you do kind of need to baby it, but if a color is amazing, and this one is, I can deal with a problematic formula. I think this color would look great on every skintone. If you are more olive-toned, it may be a truer cherry-red for you, rather than the bright red/pink you see on me, but, nevertheless, it would still be gorgeous. Cherries in the Snow is in Revlon's current line-up, and I honestly can't see this one going away. :P This color is available at major big boxes and drugstores, and everywhere you find Revlon cosmetics. You can also purchase it online both at Drugstore.com and at Walmart.com. I purchased Cherries in the Snow myself. The above links are not affiliate links. wow, you weren't kidding when you said you were on the pink/red kick after the blues!!! This color is gorgeous and I don't blame you that you're on your 3rd bottle! I've had cherries in the snow in my collection for years too, yet it's still one I've never used. I've never really had luck with revlon, as their formulas are so irritable. Looks lovely on you. Must remember to look out for this next time I'm out shopping for polish!